Today, NCLEJ filed a lawsuit in federal court on behalf of Migrant Justice, a Vermont-based grassroots organization, and its members, alleging U.S. Immigration and Customs Enforcement (ICE) and the Department of Homeland Security (DHS)―with the assistance of the Vermont Department of Motor Vehicles (DMV)―conducted an unlawful, multi-year operation to surveil, harass, arrest, and detain the organization’s members and leaders. Those activities were undertaken in retaliation for plaintiffs’ First Amendment speech and assembly and in order to destabilize Migrant Justice and its successful organizing of Vermont’s immigrant farmworkers. Farmworkers labor long hours under grueling and often dangerous conditions for low pay. Migrant Justice works diligently to organize this often-isolated community, and NCLEJ supports their efforts to improve the working conditions and protect the human rights of these low-wage workers. 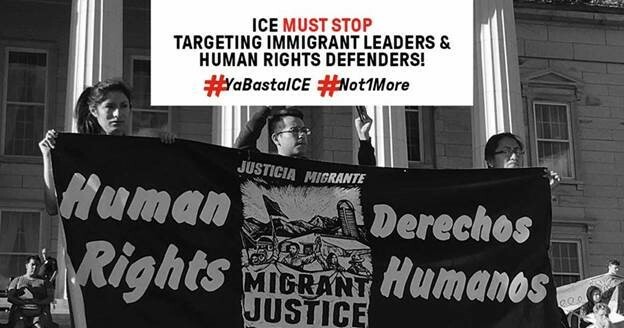 ICE’s retaliatory enforcement actions are a threat against the fundamental rights of workers to assemble and speak publicly for their rights, and part of an alarming national trend to target immigrant activists. NCLEJ brings this suit with our co-counsel, the ACLU Foundation of Vermont, the Center for Constitutional Rights, the National Immigration Law Center, and Gibson, Dunn & Crutcher, LLP. For more information, contact Senior Attorney Leah Lotto.